← OF THE DEVIL? Seriously? Mark is now to the point in his testimony of the Good News of Jesus where stories are told to explain the mission, motive of heart and righteous behavior of God’s people. 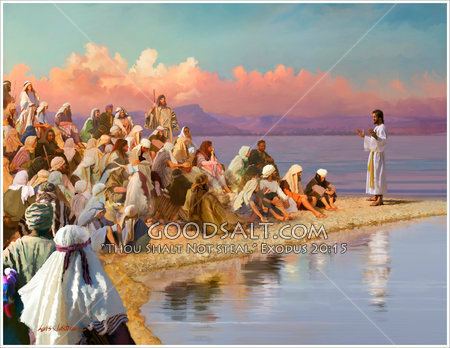 1-2 He went back to teaching by the sea. A crowd built up to such a great size that he had to get into an offshore boat, using the boat as a pulpit as the people pushed to the water’s edge. He taught by using stories, many stories. Yes! Jesus taught using stories…MANY stories! My kids tell me I am a storyteller! But they don’t always mean it as a compliment…”you have SO many words”. Early in my ministry, I was advised once by a well-meaning pastor to not tell so many stories. So, I became more aware of my stories meant to motivate others to love the Lord and pared them down to get to the point as quickly as possible. In this world, TIME is of the essence and highly guarded. Stories are still the key to unlock hearts and bring minds to thoughts of Jesus, but we have to be quick, slick to make words stick, with Jesus at the center and love in our own hearts for the people we are telling. 3-8 “Listen. What do you make of this? A farmer planted seed. As he scattered the seed, some of it fell on the road and birds ate it. Some fell in the gravel; it sprouted quickly but didn’t put down roots, so when the sun came up it withered just as quickly. Some fell in the weeds; as it came up, it was strangled among the weeds and nothing came of it. Some fell on good earth and came up with a flourish, producing a harvest exceeding his wildest dreams. 13 He continued, “Do you see how this story works? All my stories work this way. JESUS! THE MASTER STORYTELLING TEACHER! We can learn a lot from His storytelling that creates readiness (examples of everyday living) the follow through nudging hearts, minds and souls toward receptive insight with how to live! WOW! Just wow! Always present a “how” with a “should” or behavior will not change. The story is important and worth the effort to get it right. The story must be Truth. The Story is Jesus! Dear Heavenly Father, You know what makes us tick, for you created us! Thank you for coming to save us and show us how You work through the stories of Jesus! Thank you, thank you, thank you for your example and teaching that still works today. Give us the wisdom to use storytelling in your most excellent way that brings others to knowledge and acceptance of you! In Jesus Name, Amen! This entry was posted in Uncategorized and tagged Attitude, Bible, Bible devotional, Bible Lessons, Bible Study, Blessings, Christian Education, Christian life, Christian Living, devotion, devotional, Discernment, Discipleship, encouragement, Evil, Exodus, Faith, Family, Finding Focus, Finding Focus Ministries, Focus, Forgiveness, Freedom, Genesis, God, God's Grace, God's love, God's Presence, God's will, God's Word, Grace, Guidance, Healing, Holy Spirit, Hope, Insight, inspiration, Integrity, Israel, Israelites, Jesus, Jesus as LORD, Jesus Christ, joy, Leadership, LIfe, Love, Love God, Love of God, Love Others, Maturity, Mercy, Peace, Perfect Love, perspective, Plagues, Praise and Worship, prayer, Relationship, Relationships, repentance, Rest, Romans 12, Salvation, Spiritual Growth and Formation, Transformation, Truth. Bookmark the permalink.